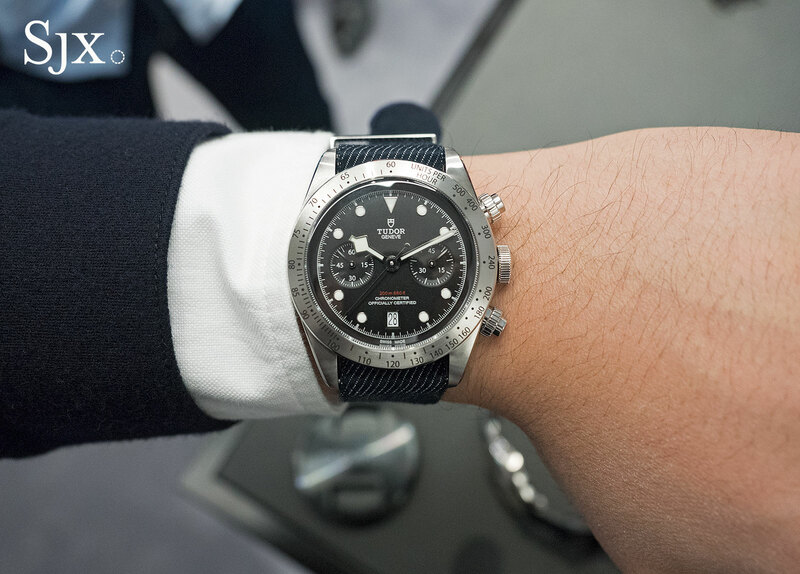 Revealed the day before Baselworld 2017 opens, the Black Bay Chrono is an amalgamation of greatest hits from vintage Tudor, with a notable new movement. Smaller than the Heritage Chrono, the Black Bay Chrono is equipped with the MT5813, a new calibre that is surprisingly the result of a collaboration with Breitling. The case is similar to that of the Heritage Chrono “Monte Carlo”, but slightly smaller with a diameter of 41mm, giving it more manageable proportions. It’s also blessed with the same polished bevel along the length of the lugs. 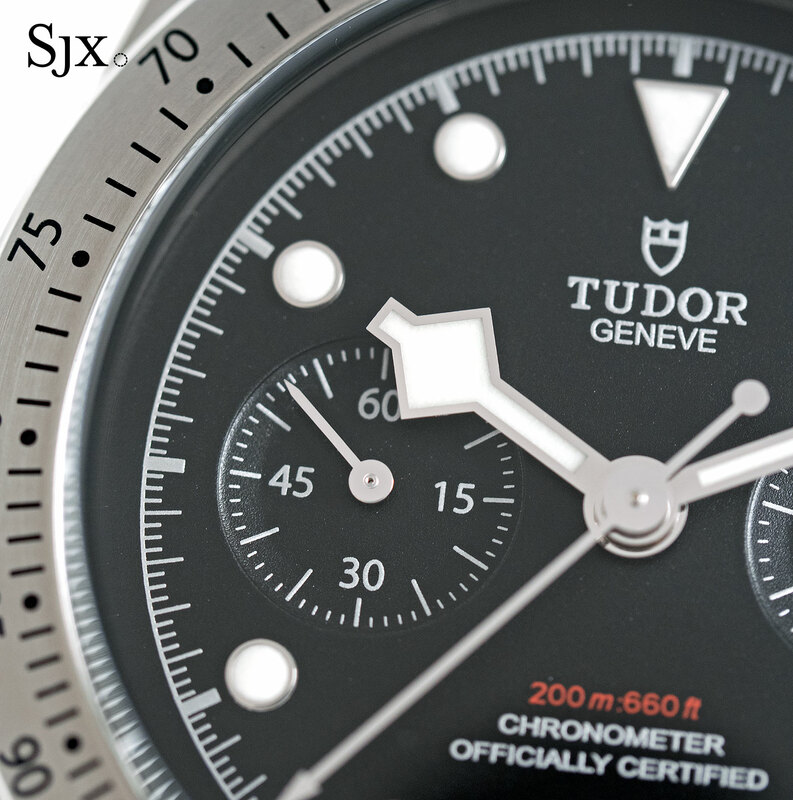 Both the crown and pushers are screw-down – the pushers are fluted as on vintage “Mk 0” Tudor chronographs – while the bezel is fixed and engraved with a tachymetric scale. 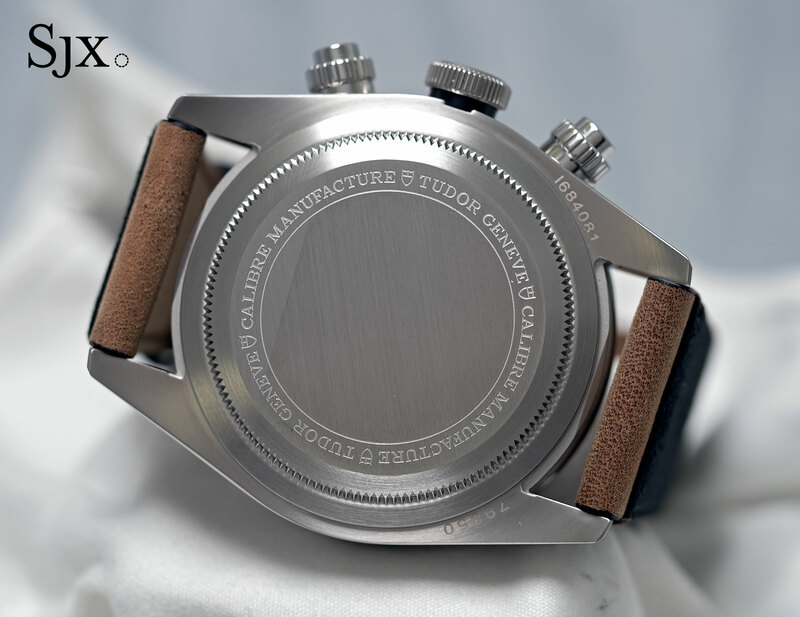 While the case is familiar in style, the movement inside is brand new, though hidden underneath a solid back. Equipped with all the features of a modern chronograph movement, the MT5813 was developed by Breitling and is based on the Breitling 01 (or B01), Breitling’s flagship chronograph movement. 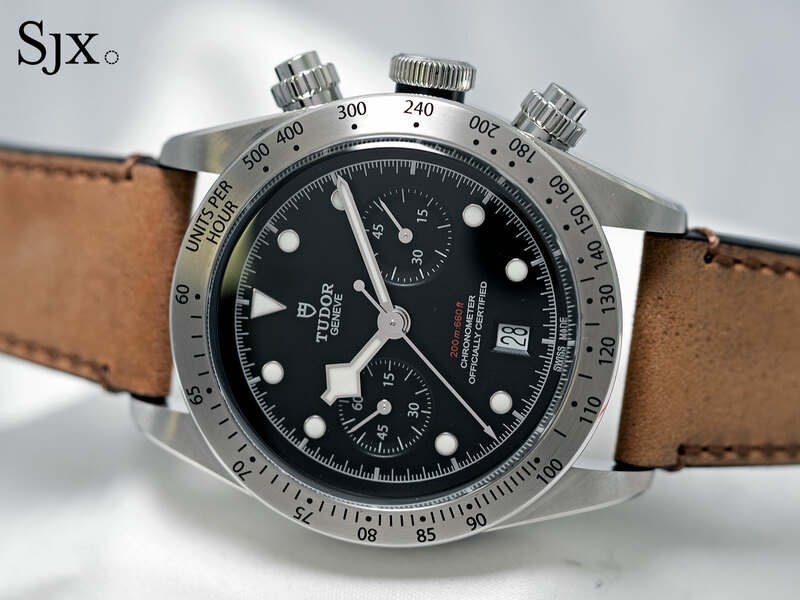 Breitling also manufactures the movement for Tudor. 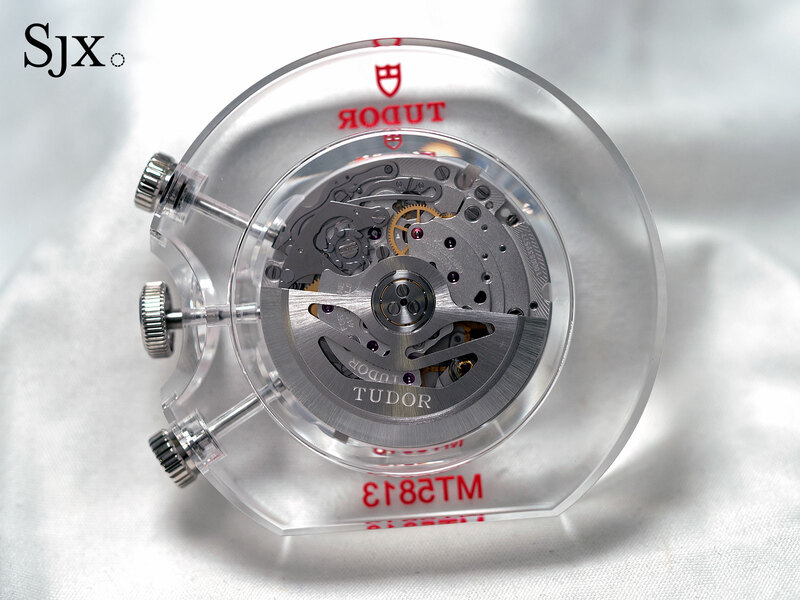 Running at 28,800 beats per hour or 4Hz, its key features are a silicon hairspring, automatic winding, three-day power reserve, as well as a foolproof date that can be adjusted at any time. 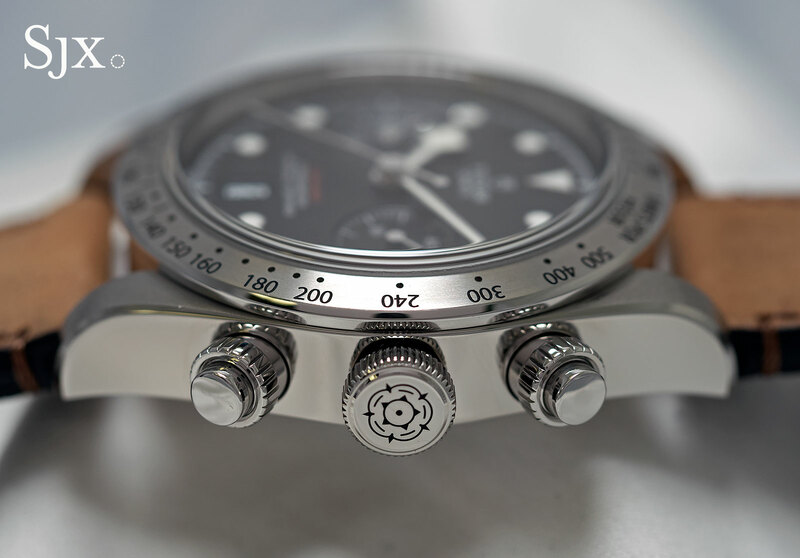 While produced by Breitling, the MT5813 is fitted with Tudor’s in-house adjustable mass balance wheel. 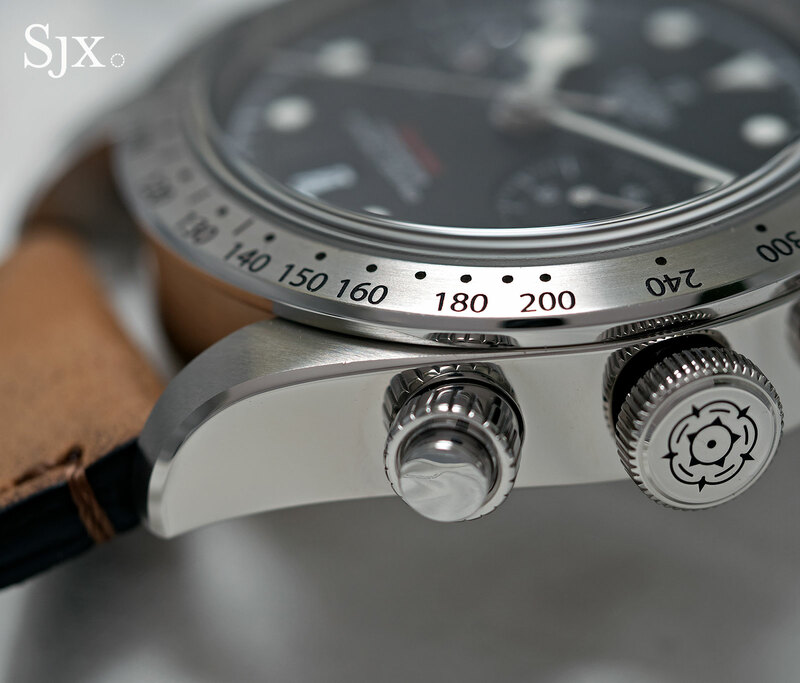 The chronograph mechanism is controlled by a column wheel, with a vertical clutch for power transmission. It has the unusual feature of a 45-minute counter at three o’clock, instead of the conventional 30-minutes. The sub-dial at nine o’clock is for constant seconds. In comparison, both versions of the Heritage Chronos are equipped with ETA movements topped with Dubois-Depraz chronograph modules – simple and low cost mechanics. 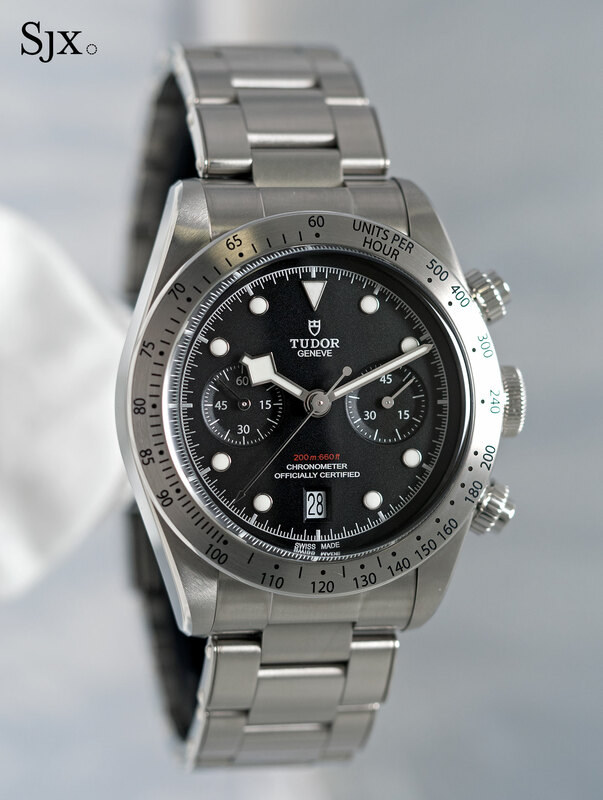 Slightly glossy with a fine, granular surface, the dial is obviously appropriated from the bestselling Black Bay dive watch, with the same hour markers and snowflake hands. 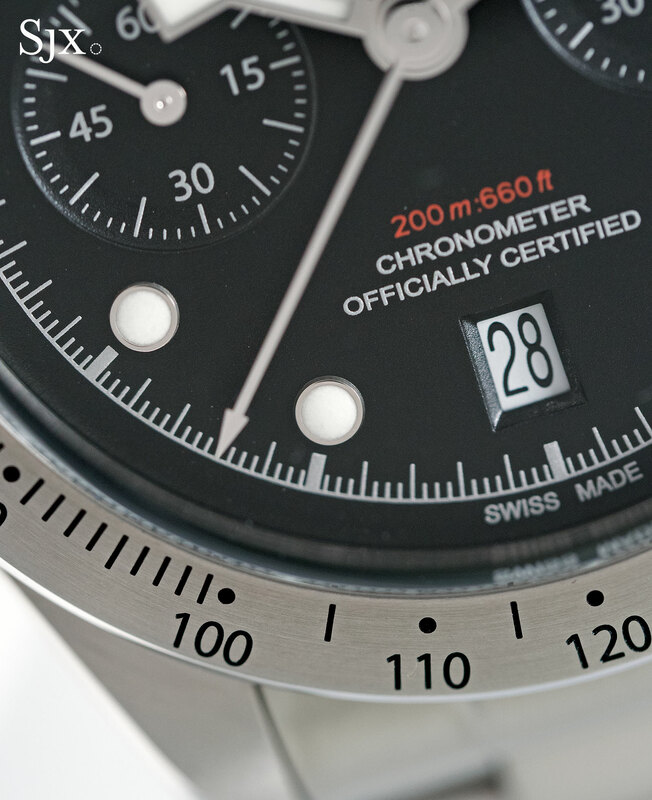 But the elements have been redesigned to suit the chronograph, primarily by reducing the scale of the hands and hour markers. 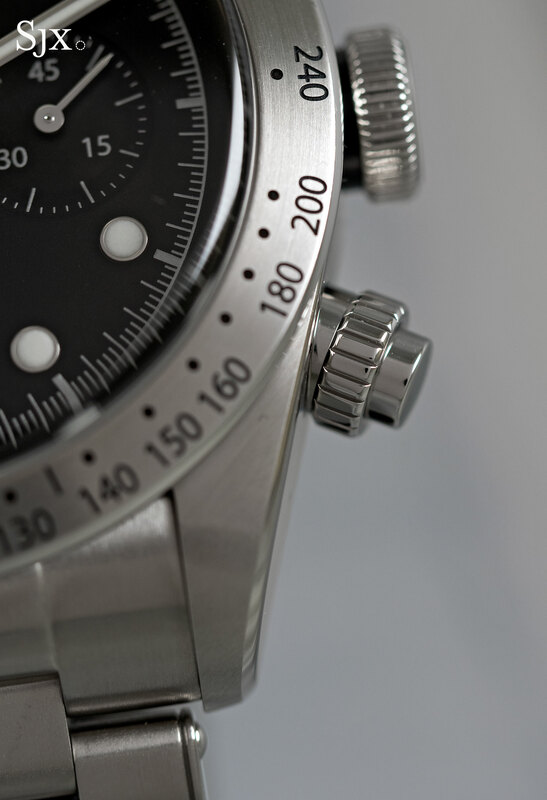 So the snowflake hour hand is noticeably smaller than on the dive watch, though it still obscures the chronograph registers at times. 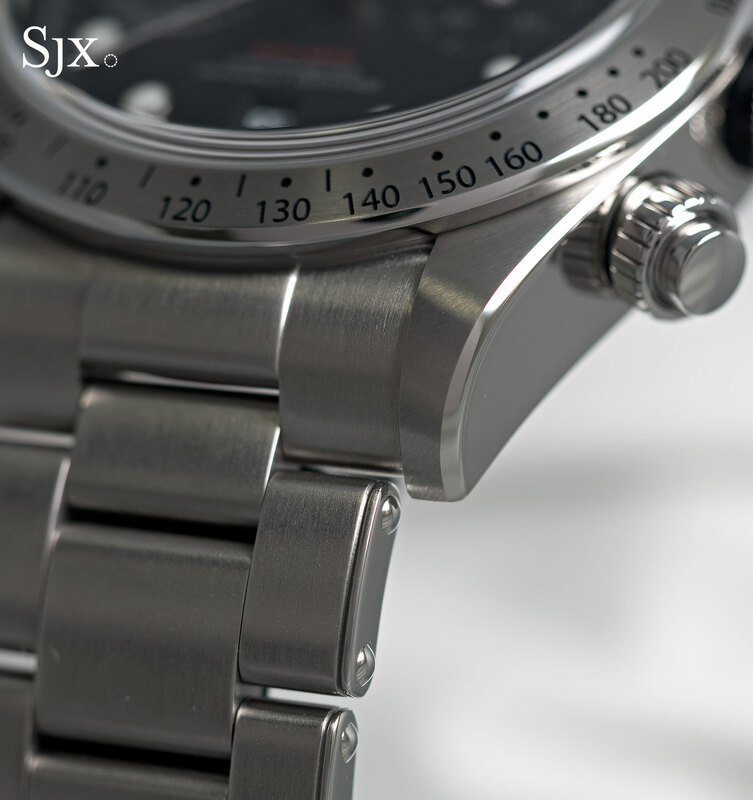 The chronograph registers are concave and slightly bowl-shaped, giving the dial a hint of depth. 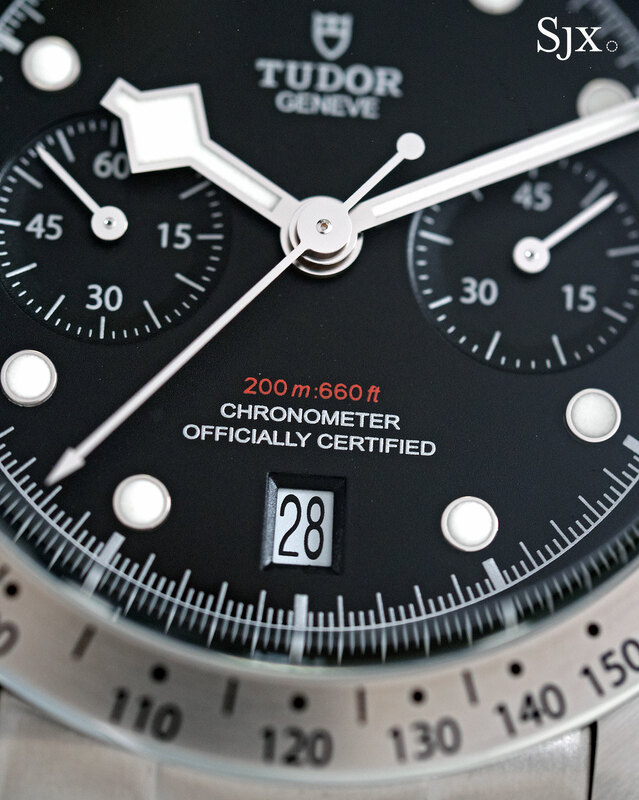 Another design element appropriated from vintage dive watches is the depth rating in red, which is matched by silver-tone print for the rest of the text. 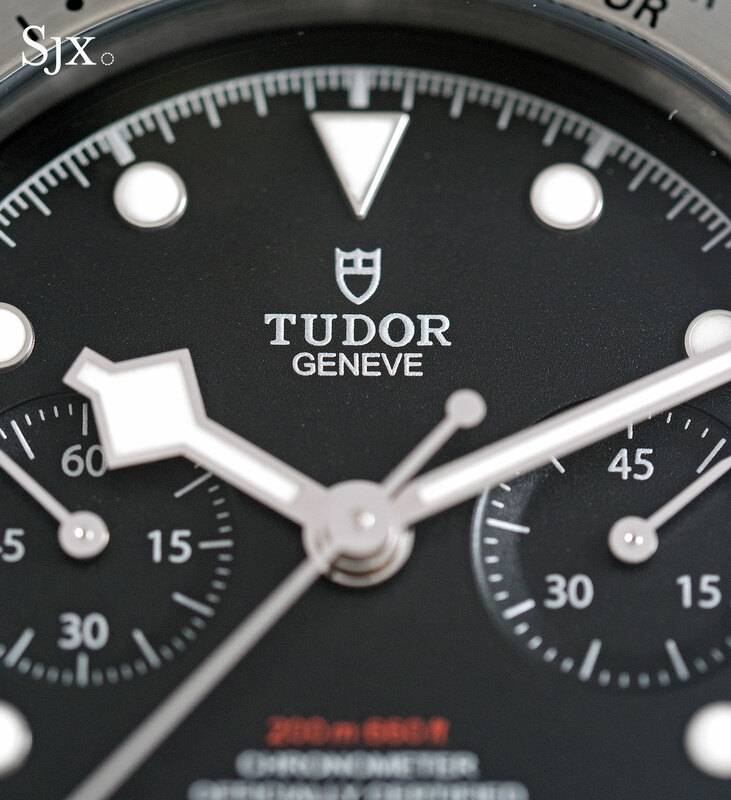 An evident amount of effort was put into blending in the disparate vintage watch elements, without it being a straightforward remake as several of the other Tudor Heritage models are. 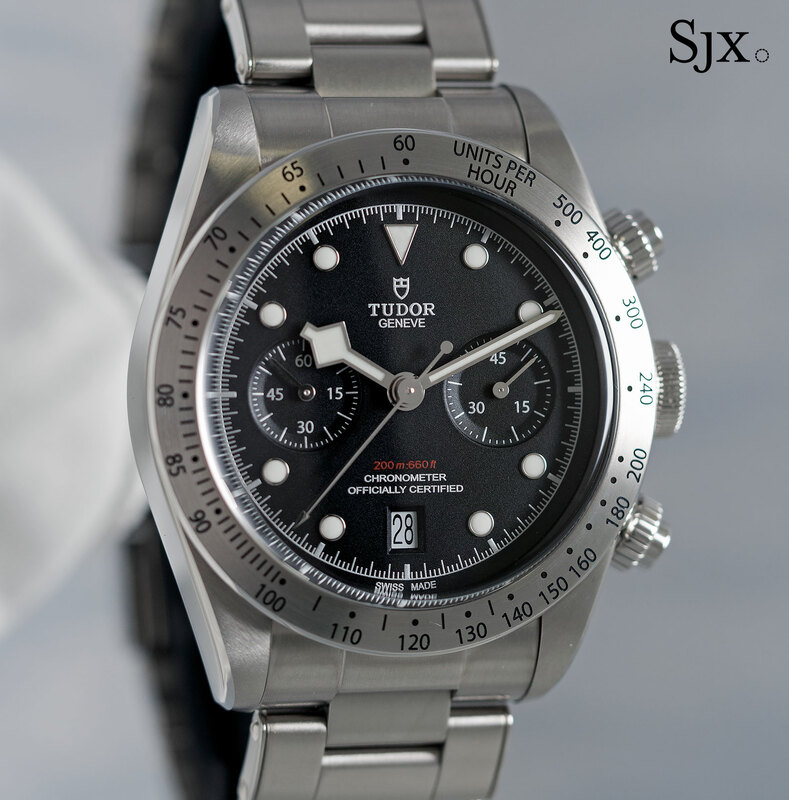 There was no vintage Tudor that looks like the Black Bay Chrono. And the reason is simple: the combination of a tachymetre bezel, a feature ostensibly for automobile racers, and the dive watch dial is incongruous from a strictly academic perspective. 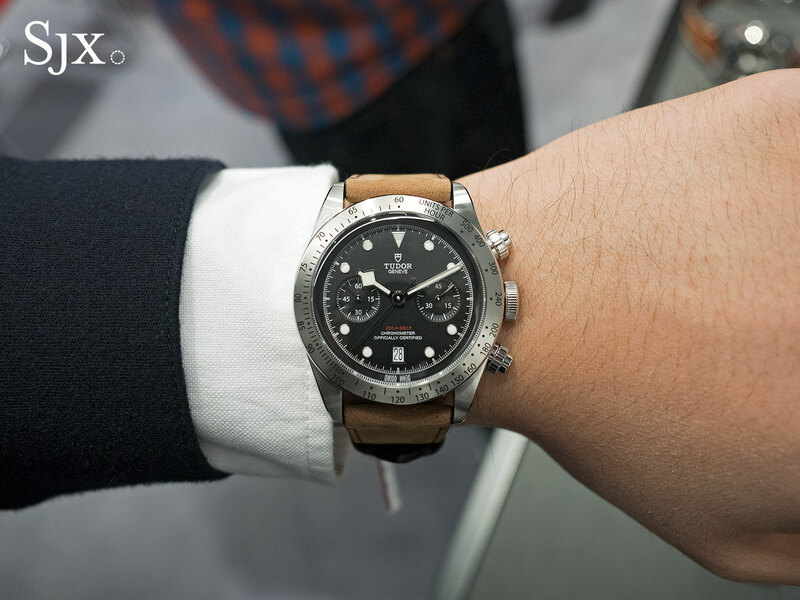 But on a more visceral, fingers-to-the-metal level, the Black Bay Chrono looks and feels good. The relatively subdued colour scheme gives it a serious, functional look, something that the colourful Monte Carlo chronographs can never achieve. 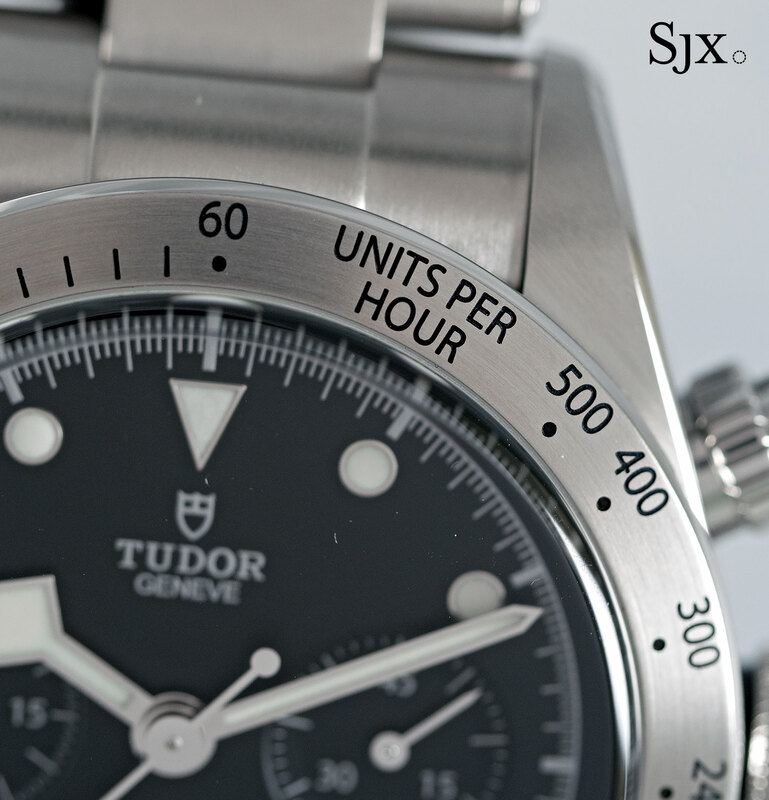 For the money – less than 10% more than the Monte Carlo chronograph – the Black Bay Chrono is an excellent buy. Lastly, it should be noted the Black Bay Chrono is an addition to the Heritage line, and does not replace the Heritage Chrono “Monte Carlo”. 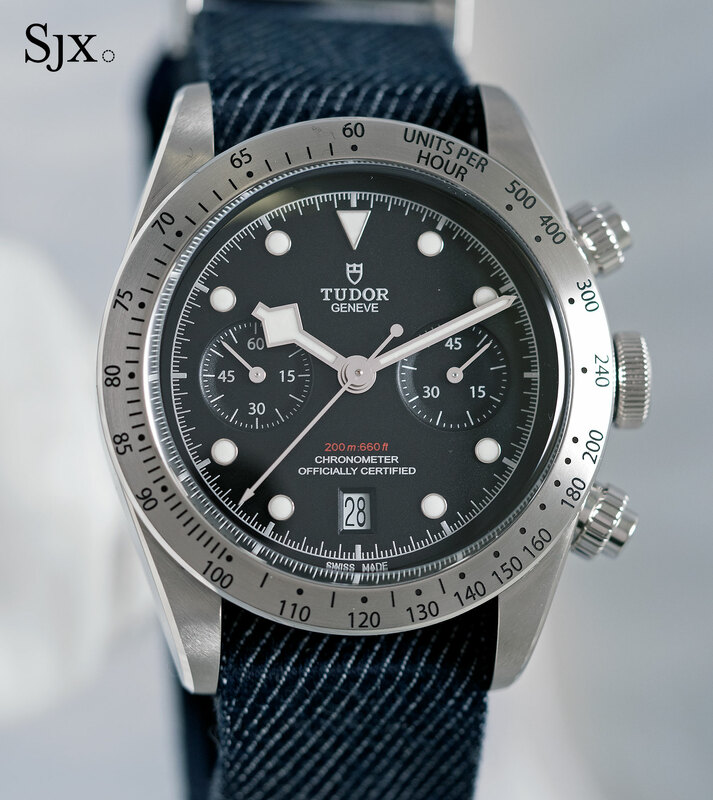 Available with a tan “pull-up” leather strap or steel bracelet with riveted links – both versions are also delivered with a fabric NATO-style strap – the Tudor Black Bay Chrono (ref. 79350) is priced at SFr4500 on strap and SFr4800 on bracelet. In Singapore it’ll cost S$6480 on the strap and S$6912 with the bracelet. It’ll be available in stores July 2017. Update March 22, 2017: Background information regarding Breitling’s development of MT5813 movement, as well as pricing info.